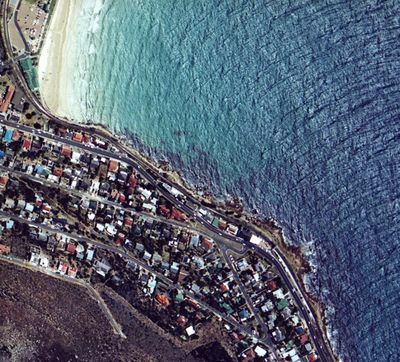 The dive site Sunny Cove is a rocky shoreline reef in the Fish Hoek area on the False Bay coast of the Cape Peninsula, near Cape Town in the Western Cape province of South Africa. The access is relatively easy and the site is fairly sheltered from south west swell. 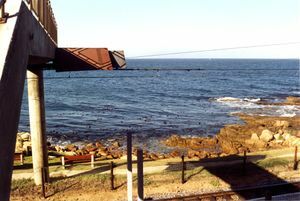 Just east of the pedestrian bridge at Sunny Cove railway station. 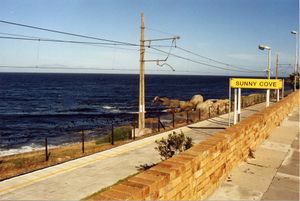 The sign on the station platform at Sunny Cove seen from the roadside. 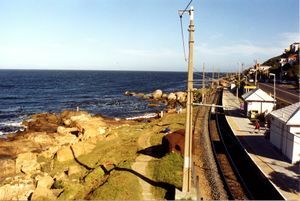 Named after the "Sunny Cove" railway station at the site, which was probably named after the general location, though it is not clear what cove is referred to. Maximum depth is approximately 11m over the sand. Moderate relief sandstone rocks, ridges and gullies shelving down to sand at about 10m. Geology: Ordivician sandstone of the Table Mountain group. Probably Peninsula formation, or the underlying Graafwater formation. Strike is north-west/south east, and the dip is shallow (about 7°)and to the south west. Often at its best during or after westerly winds. The site is fairly well sheltered from south west swell. Usually considered a winter dive site, but also may be dived in summer if the south-easter has not blown for a few days. None. The public toilets at the railway siding have been locked up and are not accessible. View of Sunny Cove from the road. The bridge on the left is where you cross the railway line. The entry and exit area is to the right of the photo on the flat rocks. This dive is generally dived from the shore, though the site appears to be less frequently dived than in the past. There is parking at the side of the main road near the station. Walk over the pedestrian bridge and to the south east about 50m to a grassy patch at the side of the path. Entry area is at the north side of the low rocky promontory visible in the middle of the aerial photo. This is also usually suitable for exit, but occasionally the inlet at the south of the promontory may be more suitable or convenient. The water is quite shallow in these areas, and there is kelp which both moderates the surge and gets in the way. Not particularly colourful, but quite a variety of invertebrate and seaweed species. Great white sharks have been seen from the shore cruising past the site. Close-up photography is most appropriate at this site. No particular routes recommended. It is often worth spending some time over the sand, but most of the dive would normally be on the inshore reefs. Sea urchins. A swimmer was taken by a great white shark near this site in 2004. No special skills are required. The site is suitable for snorkelling and has been used for training entry level divers. Moderate fitness and agility are required for the shore access. No special equipment required. A compass can be useful if you swim out over the sand. This page was last edited on 26 November 2010, at 09:45.